I can’t really say that I am overly fond of gothic metal, but once in a while I stumble across a band that manages to stand out, even in this genre of mediocrity and cliché. Wormfood from France are such a band that after all defies all genre descriptions. They are labelled an avantgarde metal band, with strong hints of gothic and doom to spice things up. And yet I would rather see them as a gothic avantgarde band, than as an avantgarde gothic band, meaning that their music really stands on its own, with the gothic elements used as an atmospheric backdrop. 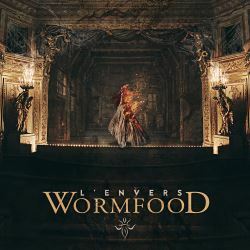 After a five year break, Wormfood are back with their fifth longplayer L’Envers, and compared to their previous efforts, they really sound as great as never before. The band that was originally from the Normandy but later relocated to Paris is fronted by vocalist Emmanuel Lévy who also is a member of Erdh and used to be a live musician for Carnival In Coal, whose former multi-instrumentalist Axel Wursthorn (love that name!) also produced this new album. Lévy, whose stage name is El Worm, sings in French in a very deep and conjuring voice that does a lot to give the music its utterly creepy atmosphere. The album starts with the one and half minute spoken word Prologue that makes you wonder if Lévy couldn’t make a living narrating audio books. This is followed by the eight and a half minute epic Serviteur du Roi, which starts like a piece of symphonic black metal but soon unfolds into many other dimensions, ending with the recurring "Je sers le roi cauchemar" chorus which is sure never to leave your mind again. Ordre de Mobilisation Générale is with nearly ten minutes the album’s longest track and once again is a master example of Wormfood’s eerie style. I didn’t read the info sheet before listening to the album, but was quite close with discovering Type O Negative and Ange as two major influences of the band. And frankly, those two bands couldn’t sound any more different, but the former’s gothic expanse combined with the latter’s chanson prog makes for a mesmerising mix in the presence of Wormfood. Mangevers is a slightly shorter song with just under six minutes that furthermore digs deep into the band’s theatrical sonic universe. After three deeply moving songs, it’s time for a little respite with Gone On The Hoist (G.O.T.H.). This three minute track comes totally unexpected. With Wursthorn on organ and Paul Bento, formerly of Carnivore and Type O Negative, on sitar, we get a catchy psych rock track sounding like the late Sixties Beatles jamming with the Sisters Of Mercy. It takes maybe some momentum out of the album, but it is also a welcome break that shows that Wormfood can have a sense of humour. But then it’s back to business again with three more serious tracks. Collectionneur de Poupées especially manages to catch the band’s turn of the century – from the 19th to the 20th – mood: decadence and absinthe aplenty in their hypnotic visions. Géhenne and Poisonne, both over eight minutes long, fitfully continue in that direction, and even if this all sounds as if the band is adhering to the same modus operandi on their six serious tracks, they all have been composed with such finesse and attention for detail that you will discover something new for a long time to come. If I have one complaint, and it is not really one, then it’s my fear that L’Envers might be impossible to improve on. This is one of those rare albums that have achieved perfection by combining different genres and elements into something truly exciting and innovative. Fans of the darker shades of metal that are tired of the ubiquitous clichés of gothic metal will find their salvation in Wormfood’s L’Envers.